That's week three of the shinty season down and each team in the Premier League has dropped points. Last year, the premier was the closest that it had ever been and this year already looks like it will be a similarly tight contest. Following their defeat at the hands of Inveraray, Kingussie fired back into form with a 7-0 win over Glasgow Mid Argyll. It leaves GMA, in their first season in the top flight, still looking for their first points. Inveraray were again involved in the headlines - but not for continuing their winning streak. After a very strong start, they could not match newly-promoted Lovat, at Kiltarlity, and found themselves on the end of a 4-2 defeat. As I was playing the squeeze box in Newtonmore on Saturday night, I thought it would be good for morale if we let them win. A gentleman I know. 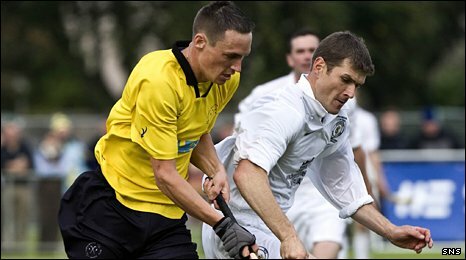 After a good start from Fort William, Newtonmore played some great shinty and beat us 3-1. This should stand them in good stead when playing against Inveraray at home this week. After this weekend, the table could look very different again as Fort William host Kingussie. Fort will be hoping for a better result this week, with three key player's returning to the squad, and it is sure to be a cracker. This week's fixture list includes Bute travelling to Tighnabruich to play Kyles Athletic, GMA take on Oban at home, and Glenurqhuhart head for Lovat. Who knows how the Premier League will look this time next week?